Discs of Lassus proliferate and not surprisingly as he was an incredibly prolific master with over 770 works surviving in many sources published during his lifetime and scattered around Europe but primarily in Munich and Venice. Others remained unpublished in his lifetime. Indeed there are those who would argue that he is really a more significant figure than Palestrina whom generations have come to revere. Surprisingly therefore there are just two Requiems by Lassus, a reasonably well known one in four parts from about 1578 and this one in five parts and found in a now Bavarian manuscript and written c.1580 but it is not clear for whom it was composed. 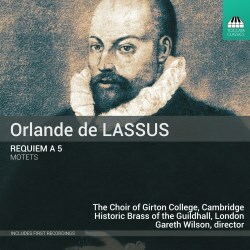 What makes this disc so compelling is its plan with the Requiem being split up around the recording and divided by appropriate motets some of which are being played just on brass others sung with the brass. There is also appropriate plainsong alternation and some organ works played sensitively by Lucy Morell on, I assume, the organ in the Toronto church, including two secular pieces arranged by the choir’s director Gareth Wilson, by John Bennett whose Weep o mine eyes seems a suitable, if unconventional choice and Lassus’s own Margot labourez les vignes which may appear to be a little eccentric but Barbara Eichner attempts to make a case out for its inclusion on the grounds that the boundaries between sacred and secular in the renaissance were rather vague. I’m not so sure, but never mind, it makes a happy contrast from the seriousness of the rest of the disc. The choir of Girton College are pictured within the CD and they are a large group, it seems about twenty-six, indeed they need to be as some of these motets like the polychoral finale Levavi oculus meus are big pieces and must have caused a fair stir in Venice where it was published before the days of Gabrieli. What you will either like or dislike about the choir may be the obvious vibrato of the sopranos, which goes against the usual sound of an Oxbridge choir. In fairness although you will notice it, especially in forte passages it is not obtrusive and personally I quite like its use. There are occasional lapses of intonation but they create over all a very expressive and an almost private devotional atmosphere. The ‘Historic Brass of the Guildhall’ consisting of cornetts and sackbuts, are new to me but they make a sonorous and beautifully balanced noise especially when accompanying the choir. The motets work most strikingly for them. The Requiem follows the normal pattern, that is the Requiem aeternam and the Kyrie the Absolve domine and the Domine Jesu Christe followed by Hostias. The Sanctus and Benedictus are paired and the Agnus Dei and Lux Aeterna are paired after the Bennet organ realisation. You will note that there is no ‘Dies irae’ as was not uncommon at the time. Its place on the CD is taken by the motet Exaudi Domine –“Hearken unto my voice Lord when I cry unto thee: have mercy upon me and hear me”. The booklet has two essays the one mentioned by Barbara Eichner which discusses each of the pieces and gives a background to Lassus and another, shorter one by Gareth Wilson giving further background and details. All texts are given and well translated.